He continued to live with his parents after their marriage. 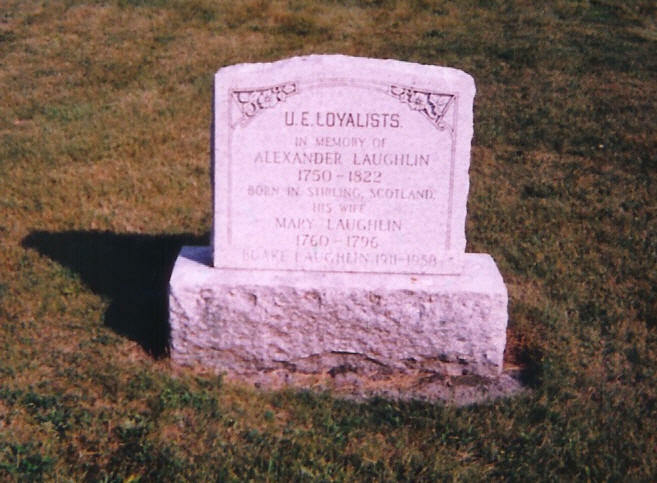 On 9-29-1818 his Father deeded him Lot 28 Ernestown, Lennox, Ontario, Canada consisting of 200 Acres. All of the children of James Laughlin were born on this Farm. There was a creek running through this property which furnished power for a saw mill built by James and his Father. The mill was still standing in 1925. On November 2, 1838, James willed the homestead to his two sons, John and Henry. Elizabeth died in 1824. James then married Mary Davey, daughter of Michael Davey and the first cousin of his first Wife, Elizabeth Davey. A piece of the homestead property was donated to the Church as a Cemetery, and is now known as Lutheran Union Cemetery. James Laughlin had a family bible which passed to his son Benjamin, then to John Shannon Laughlin, then to Mrs. Fred Laughlin of Napanee Ontario, Canada, then to Harry Scott of Napanee and then to his daughter Mrs. George Templeton who had it in 1954. James of Ernestown, m. Eizabeth Davey.